The Atopica experiment - We dare you! ALL pictures will be enlarged when clicked on. I haven’t been really sure whether the Atopica really has helped Manuel (even though we in theory have come to the conclusion that due to our very very early start with Atopica he still is in a rather “OK” situation). It is hard to know if it is the Atopica or if he “is in good period” anyway. We have discussed it and have had a feeling of that it has helped him, at least slightly but haven’t been really sure. After 7 days we could really see a clear reaction. He started getting the “famous” dark SA-crusts that felt uncomfortable, so he wanted to be stroked a lot (not his normal behaviour) and also made some minimal scratching. 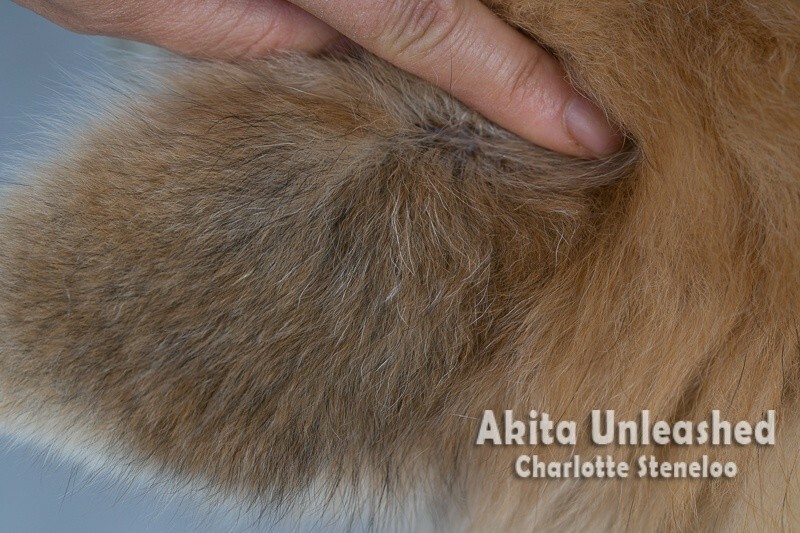 When scratching the crusts with a paw…the hair and parts of the skin comes of in patches… also in “new”, earlier unaffected areas. Well we could do nothing but wait until his stomach was OK again, and we really did not want to start too early risking a setback. Finally we thought it would be OK to start the medication again. We started to give it close to food (Atopica is absorbed in the stomach, not later on) so it hopefully was somewhat “diluted”, and then slowly moved to 4+ hours before/after food according to recommendations. The first pictures are not the best quality as I had to do them without an assistant (Mikael). :lol: Manuel was a darling standing still, but even then it is hard as I had to both be the photographer (trying to get focus on the right area) as well as being the assistant (separating the coat, moving Manuel a few centimeters to the left or right). Not looking TOO bad from a distance. We can see the spots where there is no under-coat and we can see the thin tail. 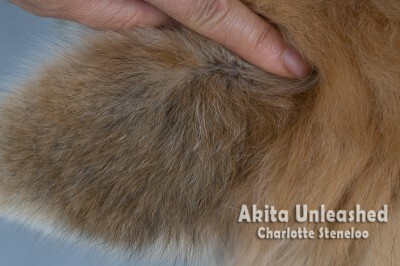 We can see the ear (with all the white hairs ;) being a bit thin in coat but it does not look too bad from a distance. But he still puts his head in my crotch (it itches) so maybe we should look closer. Let’s have a closer look. When I lift the hairs, they stick together and do not really want to change directions. It feels uncomfortable for Manuel. The skin is moist and sticky at the same time. Here you can see one picture from a distance, and then a close up, followed by pictures from the back and ears. After one week with Atopica, he is back to “normal” which is more a dry skin with flakes, but no real “crusts”. I also believe he is on his way “out from a brake-out” too regardless of the Atopica, as the inside of his ears currently not is dry and flaky. The skin almost looks “normal”. The ears have become my “early guide” on what is going on. Here you can see different areas (read the caption). Some are “old” areas and some are “new” but all taken 10 days after the pictures above. This is a “new” patch from the back, already showing improvement. This is the neck where the under-coat was lost already during the first break out. The skin is dry but otherwise OK, but must be protected from rain. 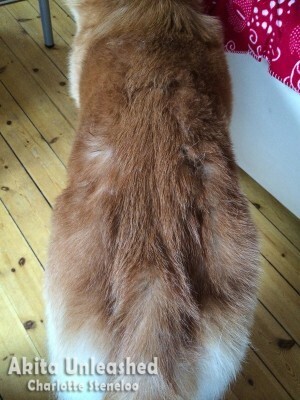 This is the tail where he also lost most of the under-coat during the first break-out. This is the “worst” part where he is flaky. Other parts of the tail are only very very dry.